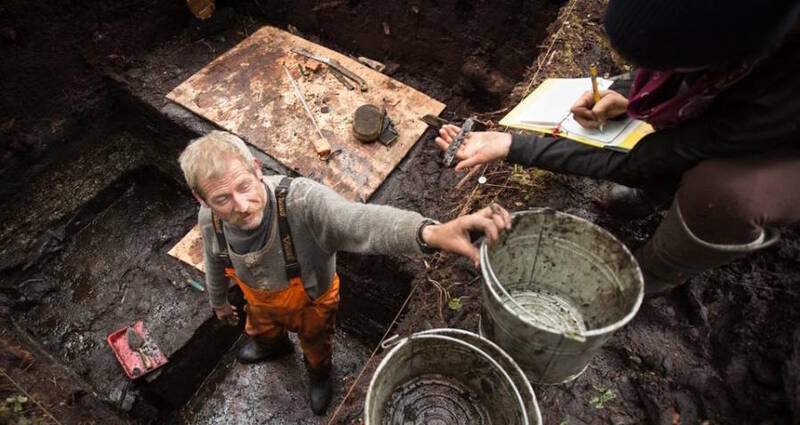 CTV reports that a team of students from the University of Victoria’s archeology department have uncovered the oldest settlement in North America. This ancient village was discovered when researchers were searching Triquet Island, an island located about 300 miles north of Victoria, British Columbia. The team found ancient fish hooks and spears, as well as tools for make fires. However, they really hit the jackpot when they found an ancient cooking hearth, from which they were able to obtain flakes of charcoal burnt by prehistoric Canadians. Using carbon dating on the charcoal flakes, the researchers were able to determine that the settlement dates back 14,000 years ago, making it significantly older than the pyramids of Ancient Egypt, which were built about 4,700 years ago. To understand how old that truly is, one has to consider that the ancient ruler of Egypt, Cleopatra lived closer in time to you than she did to the creation of the pyramids. Even to what we consider ancient people, the Egyptian pyramids were quite old. This newly discovered settlement dates back more than three times older than the pyramids. She and her team began investigating the area for ancient settlements after hearing the oral history of the indigenous Heiltsuk people, which told of a sliver of land that never froze during the last ice age. Researchers believe that this settlement indicates a mass human migration down the coast of British Columbia. The students hope to continue to search nearby islands for more evidence of this migration. The following is the introduction to my new novel, “The Wooden Box That Sings” (in progress). Watch at the end of this story to see my other adventures and how to order them. As it is known today, the Province of Manitoba is the gateway to the vast expanse of prairie land that lies between it and the Rocky Mountains. Moreover, it is arguably the birthplace of Saskatchewan’s grain fields and Alberta’s ubiquitous cattle herds, for both spring from a few seeds and a pair of cattle that were sent to the so-called ‘Selkirk Settlement’ by the Scottish nobleman Thomas Douglas, fifth Earl of Selkirk. 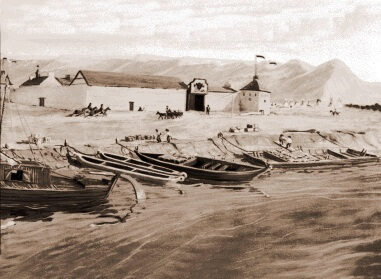 It is also testimony to the indomitable spirit of the early settlers who endured killing frosts; devastating floods; swarms of locusts six inches deep, and being caught in the middle of an all-out, bloody war, between the Hudson’s Bay Company – of which Selkirk was an owner – and its rival the North West Company. Selkirk was born in 1771, and after the unexpected deaths of his elder brothers, he succeeded to the title in 1797. As a young man, he had travelled extensively and had become interested in colonization as a means of helping his fellow countrymen who were being forced out of their homes in the Highlands. As early as 1802 there is a reference in one of his letters to Lake Winnipeg as a district suitable for an inland settlement, but no Government aid was forthcoming, and so it was not until after his marriage to Jean Wedderburn-Colville, in 1808, that he began to purchase Hudson’s Bay Company stock. This acquisition came at a time when the large landholders in Scotland were divesting their lands of tenants to make way for sheep, often employing cruel and callous means to do so, and by way of assisting these displaced persons, Selkirk offered to resettle them in Canada. Although somewhat altruistic, it was by no means outright charity, for the settlers were expected to pay £10 sterling to cover transportation, entitlement to 100 acres at 5s an acre, and one year of provisions. Moreover, it was anticipated that the first Settlers arriving at Red River would find homes and farm buildings awaiting them, gardens and crops ready to harvest, and in the colony storehouses, food supplies, clothing and implements sufficient to tide them over until they could become self-sufficient. It was a good deal, and if it had worked the way it was planned, it would have almost certainly been a success. The fly in the ointment was the North West Company, Hudson’s Bay Company’s chief rival for a lucrative fur trade that covered nearly half the continent. Unfortunately, Selkirk’s proposed settlement sat at the heart of one of the North West Company’s trade routes. To complicate matters even further, several of the North West’s directors also held large blocks of Hudson Bay stock and were in a position to cause much difficulty for the noble Lord and his visionary scheme. Consequently, when the advance workers reached their port of embarkation, there were delays caused by lack of ships, shortage of officers and sailors to crew the ships, last-minute desertions, and pettiness on the part of the customs officials. Practically all these troubles could be traced back to the North West’s interference, either in London or at the Northern ports. As it was, the ship didn’t set sail until July 26th with one hundred and twenty men on board, and with bad weather adding to the delay they didn’t arrive at York Factory on James Bay until September 24th, 1811. By this time, it was too late to make the trip south before freeze-up, and so they spent the winter hunting and building York Boats for the trip inland. It was also discovered that several of the men were quarrelsome and unsuited for the purpose, so these were returned to Scotland in the spring, leaving only thirty-five to make the trip south. Nevertheless, they set out in three boats and a canoe down the Hayes-Nelson River Route. This route was four hundred miles long with an ascent of seven hundred feet. There were thirty-four portages varying in length from sixteen feet to one mile, over which cargoes and sometimes the boats themselves had to be carried. For example: On leaving York Factory the route followed the Hayes River to the forks of the Shamattawa and Steel Rivers, up the Steel to the forks of the Hill River, up the Hill River and through Knee Lake and Oxford Lake, then by Franklin and Echemanis Rivers to the height of land at Painted Rock, a short portage over this into the West Echemanis River, through Hairy Lake and Blackwater Creek into the Nelson River and on into Playgreen Lake on which Norway House was situated. From Norway House, it was another three hundred miles across Lake Winnipeg and up the Red River to the site of the settlement at “The Forks” – the informal name for the settlement at the Red and Assiniboine Rivers. If one can imagine covering this wilderness route in a forty-foot, York Boat, it will provide some idea of the conditions under which the settlers travelled to reach the Red River. The second and third arrivals – 1812, and 1813-14 – were made up of families containing women and children. These years were particularly bad times for crofters in Scotland with one landholder discharging over one hundred tenants, and the Countess of Sutherland resorting to burning homes and the killing of cattle when the progress was not fast enough to suit her. Learning of their plight Lord Selkirk determined to help as many as he could to immigrate to the Red River. Seven hundred and twelve applications were received, but due to the interference of the ‘Northwesters’ only about one hundred could be transported due to a shortage of ships – the Northwesters having leased all available ships in the area to block Selkirk’s plan. Nevertheless, the settlers set sail on June 27th in a ship that was badly crewed and beset by bad weather. Moreover, to add to their tribulations, ‘ship’s fever’ (typhus) broke out as well. 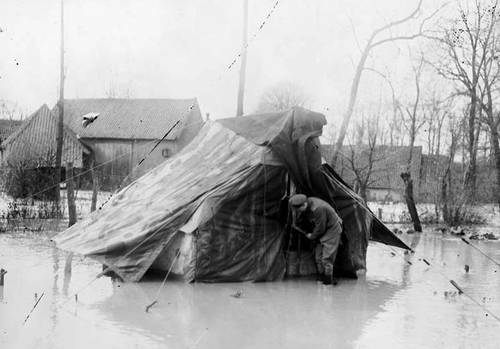 The captain then landed them at Churchill—one hundred and forty miles from York Factory, where both accommodation and supplies awaited them. Nonetheless, they wintered at Churchill, and in the spring twenty-one men and twenty women set out on snowshoes for York Factory with a stalwart piper leading the way. They paused at York Factory for only a week before they set out inland to arrive at the Red River settlement on June 21st, 1814. Having failed to discourage the incoming settlers, the North West Company then resorted to intimidation, including trying to persuade a band of Indians to attack and destroy the settlement. However, they relented when Governor Miles MacDonell agreed to surrender to exile in Montreal, which was done. In the meantime, however, the Northwesters attacked and destroyed the fledgling settlement, anyway. Undeterred, the settlers rebuilt their houses under the protection of a Hudson Bay brigade that had been brought in from Montreal, and a new band of immigrants arrived from Scotland. Therefore, the settlement was rebuilt as Fort Douglas. Equally determined, the Northwesters under Cuthbert Grant attacked Fort Douglas at a place known as “Seven Oaks,” and twenty settlers were slain in the resulting skirmish. This skirmish became known as the “Seven Oaks Massacre,” and once again the settlers were displaced. Meanwhile, Selkirk had arrived in Canada, and while in Montreal he arranged for four officers and one hundred and forty other ranks of the recently disbanded De Meuron regiment to settle at Red River in return for military service when needed. Therefore, he was at Sault Ste Marie when he heard of the massacre. Outraged, he immediately set sail for Fort William (now Thunder Bay) where he attacked the North West Company’s headquarters, releasing a pair of his men in the process. A small expedition was then sent ahead to liberate the settlement, doing so without firing a shot. Lord Selkirk reached the settlement in June 1817 and remained there until September arranging for such things as a Presbyterian Church and school to be built. In the meantime, he was served with a summons to appear in Montreal to answer to charges brought against him by the North West Company. For the next two years, therefore, he fought a losing battle in the Canadian courts that were stacked by the powerful friends of the Northwesters, and returned to Scotland in 1819 a very sick man. He subsequently died in the south of France in 1820. Ironically, under pressure from the British Government the two competing ‘superpowers’ were persuaded to amalgamate, and did so in 1821. Thereafter, the settlers were able to develop their farms without fear of attack. On the topic of farming, no farm would seem complete without livestock, but being an isolated settlement everything that wasn’t available locally had to be imported from the Old Country via York Factory and along the aforementioned Hayes-Nelson waterway. However, according to Grant MacEwan, fortune smiled upon them when a yearling heifer and bull were discovered at Oxford House, about halfway to the settlement. Therefore the two young critters – appropriately named “Adam” and “Eve” – were bundled into separate canoes for the remainder of the trip; roughly 350 miles. A mention need hardly be made of the dangers of transporting a young bull in a canoe, especially through fast water; however, Adam and Eve seemed to have been on their best bovine behaviour, and apparently learned to step in and out of the canoe with exercised care. They also grazed quietly while the men were carrying bales and boats over the numerous portages. Consequently, approximately thirty days later, Adam and Eve were grazing contentedly on the banks of the Selkirk Settlement. Three more head were acquired after that, a bull and two cows, but the bull proved vicious and had to be slaughtered that fall. By this time the good cow Eve had a calf, and the settlement – and all of western Canada for that matter – could boast a beef population of six animals in 1813. Unfortunately, some of these were killed and eaten by marauding Indians, and the growing of grain was not experiencing any greater fortune. The first year, 1813, the wheat proved to be the wrong variety and did not mature. The next year’s planting was lost to frost, and the conflict with the Northwesters prevented harvesting for the next two years. In 1817 frost once again claimed the crop, and locusts attacked it for the two subsequent seasons. Nonetheless, the hardy Scots – now Canadians – proved triumphant over men and nature, and we are the better for it. The York boat was a large rowboat (40’ long x 8’ wide) used by the Hudson’s Bay Company to carry furs and trade goods along inland waterways in Rupert’s Land, the watershed stretching from Hudson Bay to the eastern slopes of the Rocky Mountains. Thanks for dropping by. To see my full-length adventure stories, click on the individual images below. “We should write our own history books … because … a nation without a past is a lost nation, and a people without a past is a people without a soul” ~ Sir Seretse Khama, President of Botswana, 1970. When the sun-burnt, mosquito-bitten officers of the North-West Mounted Police (NWMP) rode into Writing-on-Stone in the fall of 1874, they were disheartened, saddle-weary, and lost. The previous winter, they had first come together as a unit in Fort Dufferin, Manitoba. That summer, after months of training, they rode out west bound for the notorious Fort Whoop-Up, determined to bring law and order to the Canadian Wild West. Unfortunately, some of the Metis guides they hired had a less than complete knowledge of the western territory’s geography. By early fall, the Mounties found themselves straddling the Boundary Commission Trail on the Canadian-American border with no idea where they were in relation to their destination, Whoop-Up Country. 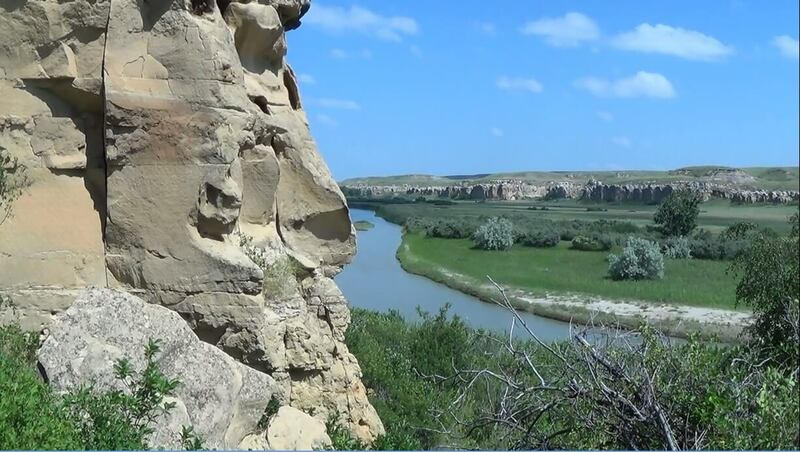 The Force’s Assistant Commissioner James Macleod and a handful of officers rode south to Fort Benton, Montana, in the hopes that they might find some directions. They found better. Two of the town’s most prominent businessman hosted the Mounties. 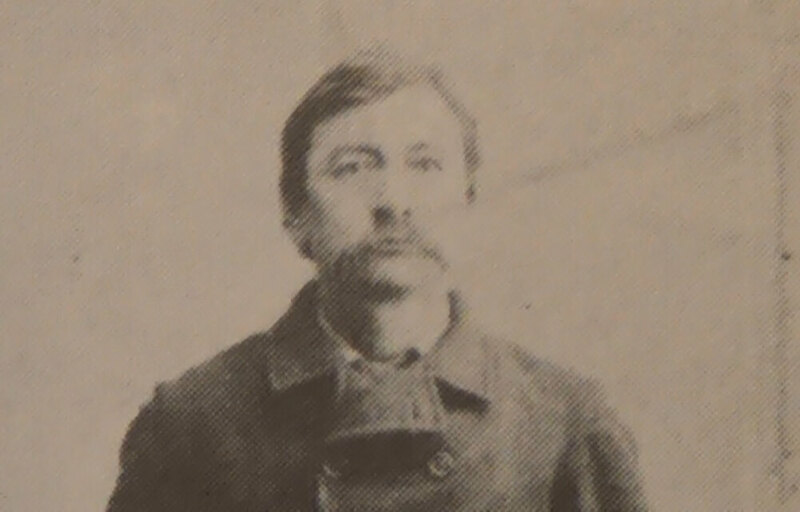 During dinner, the Montanan merchants suggested that Macleod and company hire a short, bowlegged Scots-Blackfoot frontiersman named Jerry Potts as their guide. Despite learning that the unimposing mustachioed plainsman was a man of few words who had an enormous appetite for whisky, the commodity which they hoped eliminate from the Canadian plains, the Mounties took their suggestion and hired Jerry Potts as their chief scout. They couldn’t have been happier with their decision. Jerry Potts returned with Macleod to Writing-on-Stone, took up a position at the head of the column, and led the bedraggled Mounties northwest over prairies and coulees. Said Mountie Sam Steele of the quiet, mysterious guide, “he never talked with others when he was at work. He would ride on ahead by himself, keeping his mind fixed on the mysterious business of finding the way. He was never able to give any clear explanation of his method. Some mysterious power, perhaps a heritage from his Indian ancestors, was at work.” In no time, Potts led the Mounted Policemen to Fort Whoop-Up, on the banks of the Oldman River. Shortly thereafter, he led them upriver to the location at which they would build Fort Macleod, their first permanent headquarters. In the ensuing months, Potts, who was fluent in a number of Indian languages, also served the Mounties as an interpreter and Indian ambassador. While the Policemen were building Fort Macleod, he traveled throughout the territory to speak with the local Blackfoot chiefs, on whose lands the Mounties encroached. 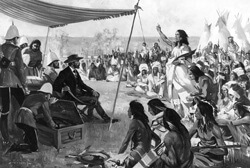 Potts informed the chiefs that the red coats were there to suppress the whisky trade which had brought the Blackfoot people so much grief, and that they had their interests at heart. The officers who accompanied Potts on these excursions noticed how the powerful Blackfoot chiefs treated the wiry half-breed with deference and respect and took him at his word. The scout, they soon realized, was well-known and highly respected among the people of the plains. Over the years, various Mounties got the taciturn frontiersman to open up and reveal his mysterious past, which, if the manner in which the Blackfoot treated him was any judge, had evidently earned him a ferocious reputation throughout the Canadian-American plains. As it turned out, Jerry Potts was a man of two worlds. He spent half his time among his father’s people, the predominantly-white traders and ranchers of Fort Benton, Montana, working for various fur trading companies. While at the Fort, one of his favorite past-times was to fortify himself with whisky before playing a gutsy game with his co-worker and fellow half-breed George Star, in which the two of them, armed with revolvers, would stand 20 paces apart and literally trim each other’s mustaches with bullets. 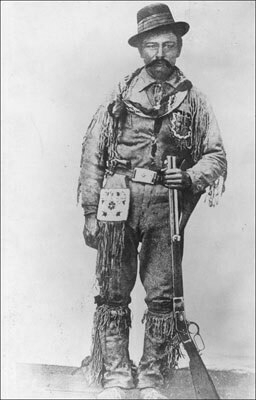 In the white man’s world, Jerry Potts’ primary function was that of a scout. As a result, he often found himself far from the Fort in hostile Sioux territory. 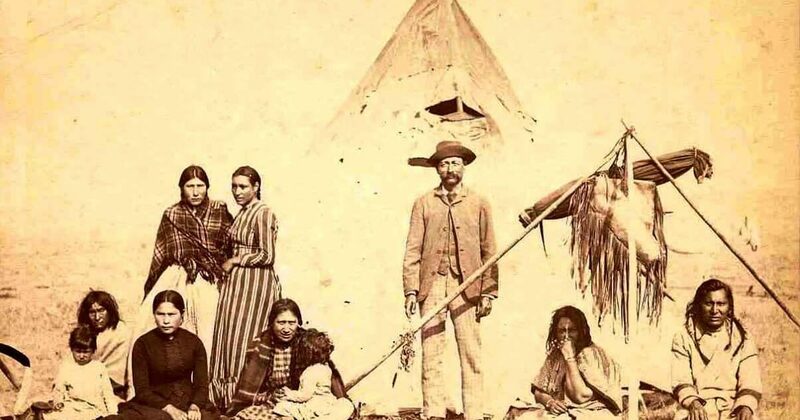 One time, while on a scouting expedition with two white men, Potts and his charges were set upon by a war party of about 200 well-equipped Sioux braves. At first, the half-breed ordered his charges to flee on horseback. When he realized that some of the warriors mounted on faster horses would inevitably catch up to them, however, Potts suddenly ordered his two clients to wheel around and ride through the Sioux ranks. After passing through the horde unscathed, Potts had his clients take shelter in a nearby abandoned cabin, where he, armed with nothing more than a revolver, managed to fend off the enterprising braves who rushed their location. That night, after sneaking into the Sioux camp and stealing three of their best horses, Potts and his two charges rode back to the Fort, escaping certain death. When he was not working for the fur traders of Fort Benton, Jerry Potts lived among his mother’s people, the Blackfoot. He participated wholeheartedly in various raiding parties and war parties against the Sioux, Crow, Shoshone, Cree, and Assiniboine, and quickly established himself as a formidable warrior and horse thief. 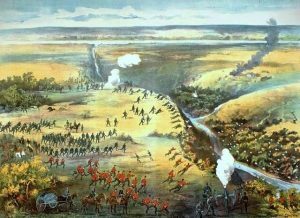 On October 25, 1870, Potts participated in the Battle of Belly River, the last great battle between the Blackfoot and Iron Confederacies and the last great inter-tribal Indian battle in the world. 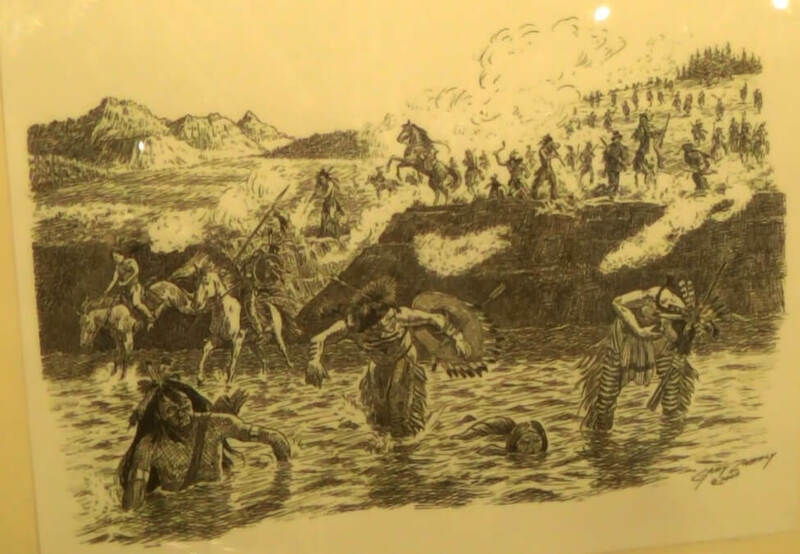 It was due to Potts’ leadership that the Blackfoot were able to take advantage of a Cree-Assiniboine retreat, turn the tide of the battle in their favour, and completely route their enemies. Due to his martial prowess, and the fact that he, despite his extensive combat experience, was never wounded in battle, the Blackfoot began to regard him with superstitious awe. Potts himself was imbued with the superstitious nature of a Blackfoot and, due to instructions he received in a dream, wore a catskin amulet around his neck day and night for good luck. In 1869, Jerry Potts guided John Healy, Alfred Hamilton, and a handful of American whisky traders from Fort Benton to a place on the Oldman River. There, the whisky traders built Fort Whoop-Up, the notorious whisky fort which’s calamitous traffic, in essence, became the main reason for the formation of the North West Mounted Police. Throughout he early 1870’s, Potts watched in horror as the Canadian whisky trade, which he helped establish, succeeded in all but destroying his mother’s people, the Blackfoot. In the spring of 1872, Potts’ mother and brother were killed in a whisky fueled argument. When Potts received word of the incident, he avowed to avenge their murders. About two months later, while watering horses near a Canadian whisky post called Fort Kipp, Potts spotted his mother and brother’s murderer riding out from the fort. The half-breed, furious, pursued the Indian and killed him just a short distance from his own camp. Following the death of his mother and brother, Potts sought an end to the whisky trade, and was more than happy to assist the Mounties when they rode into Fort Benton in search of a guide. Blackfoot Chief Crowfoot orating at the signing of Treaty 7. After joining the Mounties, Jerry Potts performed the functions of scout and interpreter. By all accounts, he was a magnificent scout, and an abysmal interpreter. In the winter of early 1875, he led his respective Mountie charges through blizzards on two different occasions, during one of which he was rendered snow-blind. Said Sam Steele of his scouting ability,“he possessed an uncanny sense of locality and direction. Others could guide travelers through country they had visited before, but this man could take a party from place to place by the quickest route, through country altogether unknown to him, without compass and without sight of the stars.” On the other hand, during the signing of Treaty 7, during which the Blackfoot Nations made an agreement with the British Crown, Potts served as interpreter between the Blackfoot chiefs and Government of Canada representatives… that is, until called upon to translate Governor of the North-West Territory David Laird’s eloquent speech into Blackfoot. Potts, a man of limited frontier vocabulary, had no idea what the well-educated governor was saying, and said as much when called upon to interpret. As a scout and Indian ambassador, Jerry Potts proved to be an invaluable asset to the Mounties. However, his love of whisky often strained his relationship with his superiors. For example, during the early days of the suppression of the whisky trade, Potts and a few officers of the NWMP accosted a pair of bootleggers smuggling whisky across the 49th parallel. The half-breed, who was tasked with keeping an eye on the prisoners in the back of their wagon, broke into the contraband and shared it with the men he was supposed to be guarding. In the words of Constable Robert Wilson, one of the Mounties who accompanied Potts on this mission, “the two prisoners and Jerry were soon howling drunk…” The three men promptly quaffed all the evidence of their wrongdoing, much to the displeasure of Potts’ superiors once they got wind of the incident. The Battle of Fish Creek during the North-West Rebellion. To order a copy, or view any of my books, just click on the above ad. click on logo to discover my latest books. 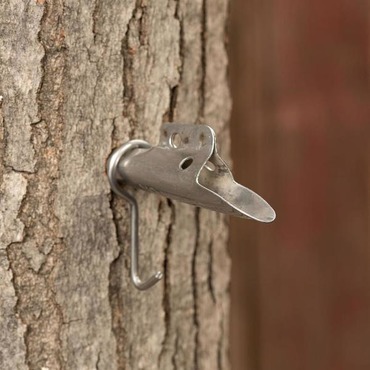 Maple sugaring time is, to this very day, a cherished memory for me. Each stage comes back as special, and each one is as vivid as the day it happened nearly eighty years ago. My father and my favourite Uncle Fred shared a ‘sugar bush’ together, and each spring, when the sap started to flow, they would emerge from their long winter doldrums to start ‘spiling’ the trees. This involved going from tree to tree (nearly 200 of them) with a hand auger and a pail of spiles to ‘tap’ the trees – sometimes three to a tree. Maple spiles as they were in my time. My job was to hammer the spiles into place when father bored the holes. Nonetheless, it was a father-son collaboration that is hardly known today. 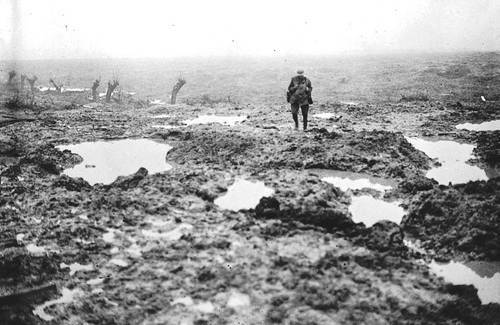 In my mind, we were ‘men’ working together, and whether or not it was cold and damp, I persevered as men did in those days. The next stage was the gathering of the sap. this was done in two wooden barrels affixed to a ‘stone boat’ (a skid with two log runners) that was pulled by “Dolly and “Molly” – our two Clydesdale horses. It was then poured into four ‘evaporating pans’ that were placed atop a brick fireplace. As the raw sap ‘boiled off’ in the first plan it was transferred to the next until the last pan held the pure elixir – golden and sweet, and as pretty to look at as it was to taste. But here is where the real memories take shape. Most of the boiling off took place at night, and so, on weekends, my sister Beverley and myself were allowed to join father and Uncle Fred until the day’s batch was finished – around 10:30 or 11:00 PM. Included in these memories are the crackling of the fire echoing throughout the forest, and the mouth-watering aroma of maple syrup as it nears perfection – not to mention the taste of ‘maple snow’ in a cup – which we just happened to bring along. Then, with a cream can full of syrup (about two or three gallons), we would start for home under the light of a full or crescent moon. 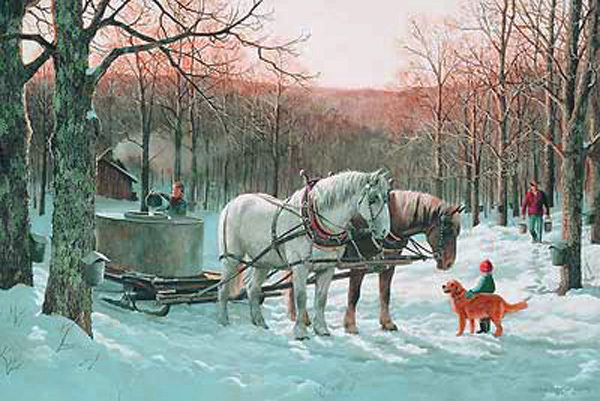 Nonetheless, the stillness of the forest seemed to accompany us with only the jingling of harness and the plop-plopping of the horses’ hooves to break the frosty silence of a March night. Therefore, there is not an early spring goes by that I don’t think of these tumes and the people – long gone – that accompany them. Click on the image to view my latest books. 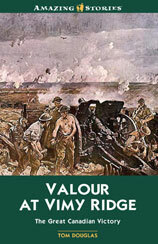 To order a copy of any of Gerry Burnie’s books, click here. Lewis Urry – The Canadian inventor of the modern-day battery powered the consumer electronics revolution that forever changed the holiday shopping season. The alkaline cell he created in 1957 brought portable power to the masses, making batteries a consumer staple used around the world. Lewis Urry was particularly proud of his life’s work at Christmastime. The Canadian inventor of the modern-day battery powered the consumer electronics revolution that forever changed the holiday shopping season. The alkaline cell he created in 1957 brought portable power to the masses, making batteries a consumer staple used around the world. The global market for household batteries is worth about $4.5-billion (U.S.) a year. A growing list of products ranging from toys to household appliances run on battery technology inspired by Mr. Urry’s innovation. Consumers still gripe about limited battery life, but we live in a paradise of cheap, portable energy compared to the batteries available in 1955, when Union Carbide Corp., owner of the Eveready battery brand, brought the 28-year-old chemical engineer to its Cleveland-area lab from Toronto. There, Mr. Urry joined a team working to address this long-standing drawback of the technology, which dates back more than 200 years. The very first battery was developed in 1799 by Italian inventor Alessandro Volta. Known as Voltaic piles, those batteries were stacks of different metals separated by brine-soaked paper that generated just enough electricity to operate simple mechanisms. Just one of Mr. Volta’s batteries could be as big as a modern toaster, but only generate a weak current. Still, they proved that electricity could be generated chemically. Although the technology has evolved over the years, modern-day batteries still function in a similar way. They produce a current when an electrolyte material separates but connects two other materials: a cathode and an anode. Over the next 150 years, an increasing number of devices were made to exploit the smaller batteries that were being developed by later scientists including Canada’s Mr. Urry. Born in Pontypool, Ont., a village near the Kawartha Lakes, roughly 100 kilometres northeast of Toronto, Mr. Urry graduated from the University of Toronto in 1950 with a degree in chemical engineering. He had served in the Canadian military from 1946 to 1949, and joined Eveready right after graduation. Speaking to the Associated Press in 1999, Mr. Urry explained that after moving to Cleveland he quickly abandoned the idea of working with the company’s preferred chemistry. Eveready made carbon-zinc-based power cells. They were stable and safe but had a weak charge that expired after a few minutes use with a motorized toy. Instead, he followed earlier experiments with alkalines as the electrolyte to see if they could be made commercially viable. Manganese dioxide and solid zinc worked fine with alkaline, but Mr. Urry claimed his eureka moment was when he realized powdered zinc would allow for more surface area. He was testing these materials in a hollowed-out flashlight tube, working on the large D-cell-sized batteries most modern electronics eschew. To prove that he had developed something special, in 1957 he put on a demonstration for R.L. Glover, Eveready’s vice-president of technology. He bought two electric cars, put his battery in one and a conventional cell in another, pitting them in a head-to-head race. 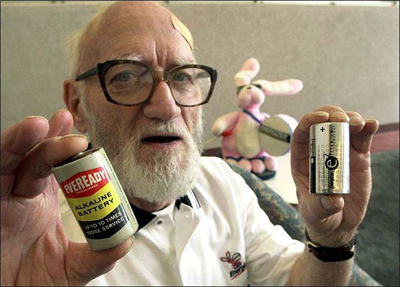 Mr. Urry’s prototype battery is housed in the same room at the Smithsonian Institute as Thomas Edison’s light bulb, along with the first commercially produced Eveready alkaline batteries, which went on sale in 1959. Over the years, the company has wrung up to 40 times more battery life out of Mr. Urry’s design, and went through some dramatic changes of its own. In 1980, Eveready changed its name to Energizer. Years later, it debuted its signature pink bunny mascot. For his part, Mr. Urry spent 54 years with the company, eventually becoming an American citizen. He collected more than 50 patents, including some on the lithium batteries that dominate digital cameras and make smartphones possible. After retiring in 2003, he passed away in Cleveland the following year at the age of 77. He kept a low profile, but remains the pride of Pontypool. click on the logo to discover my latest books.